The Romans planted the first vines in Bergerac and during the 1st century, the poset Ausone, vine-grower and consul, was already praising the quality of the local wine produced on the Dordogne River. History tells us that Ausone was correct; like all the best wine regions, Bergerac combines all the right conditions for a great vineyard. The warmth of the Aquitaine and the temperate climate of the Dordogne River; the hillsides and plateaus, which provide maximum sunshine and perfect drainage; the poor quality rocky limestone soils that force the vines to work harder. All these factors produce wines with wonderful flavours and aromas. These natural treasures would be worthless without man’s know-how in combining grape varieties with the right soils, cultivating the vine, the art of winemaking and maturing them in the barrels. In Bergerac, wine making is 2,000 years old; and it is the many generations of vine-growers that have cultivated the process into an art. Today, vine-growers try to combine the legacy of this tradition with the most recent innovations in oenology. Great effort has been put into improving the quality and the techniques used during the grape-harvest, wine-making, maturing and bottling at the property using the latest natural processes. Being at the crossroads of ancient trade routes, the Bergeracois vine-grower is hospitable and welcoming with by nature, with a cheerfulness that belies their principal characteristic: tenacity. The vineyard is a very important part of the Périgourdine gastronomic culture. Since the phylloxera crisis (1868 to 1895), the vineyards are now only in the Bergeracois region. Wine making represents the most important growth area of the regions agricultural economy. The region’s wine production covers all types of wines: red, white, dry or botrytized wines, “primeur” wine (made to be drunk young) or wine for ageing. The number of methods and appellation of wines produced are as diverse as the region itself. The region produces from 50,000,000 to 55,000,000 litres (110,000,000 to 120,000,000 gallons) of AOC wine per year. AOC (Appellation d’Origine Controlee) is the classification awarded to French wines guaranteeing that they were produced in the region specified, using vines and production methods approved by the regulating body. From Eymet in the south to the valley of Issigeac in the East and North to Saussignac. The majority of the vineyards are found in South Dordogne, on the southern hillsides of the Dordogne, where the viticulture is a quasi-monoculture. The appellations Monbazillac and Saussignac are found here as the clay-limestone soil becomes more and more a limestone soil towards the south. From Mouleydier in the East to Fleix in the West, there is a small production area, that produces mainly red wine. It is a collection of small wine farms, often in polyculture, established in large forested areas, except the Pécharmant vineyard, which represents another monoculture. Vélines, Villefranche-de-Longchapt. The area of Montravel specialises in white wines, but the red Bergerac is also well represented. It is also an area of small wine farms with a large number of cooperatives. 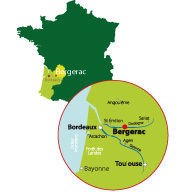 Terrains and landscapes, everything makes you think of a Bordeaux enclave more than a Périgourdine area in AOC Bergerac. That's because It is only separated from the AOC Bordeaux and Entre-deux-Mers by the river. Minzac or Villefranche are besides Côtes de Castillon and Saint-Émilion. 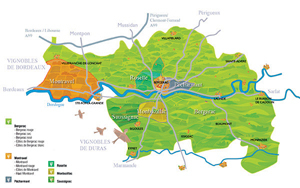 At the heart of the Périgord, south of Bergerac, in Dordogne, the vineyards can be found around Monbazillac, Colombier, Pomport, Rouffignac-de-Sigoulès and Saint-Laurent-des-Vignes. In total, 2,700 hectares of clay-limestone soil, surrounded by the Dordogne and Gardonnette valleys. Produced on the whole AOC zone. The grape varieties used are the Bordeaux traditional grape varieties; Merlot, Cabernets Franc and Sauvignon, and also Malbec which is better known in Cahors. They are generally wines which are soft in the mouth, delicate, with a red fruit smell, little tannic, and should be drunk within two to three years depending on the grape harvest. The Côtes de Bergerac wines, with their accreditation criteria becoming stricter and stricter, are for ageing, more structured, richer, which can be kept for 5 years or more. Wine enthusiasts will be able to find excellent products around the region’s wine storehouses, which offer great value for money. The Saint-Émilion of the Bergeracois, as we like to call it is little area North of Bergerac (only 300 hectares! ), its soils, its orientation and its small harvest gives it a unique character. These wines are concentrated, rich and long AGEING; the maceration time can produce traditional wines, tannic, or more supple wines, better suited to the modern palates. More than half the production is matured in new casks, providing vanilla aromas and an admirable roundness to this wine. Rose production is expanding in our region; usually they are elaborated ‘par saignée’ (short maceration, twenty four hours maximum) and Cabernet Sauvignon based. They are wines to drink young and fresh; pleasant, refreshing and perfumed. These wines are constantly improving thanks to the developments in oenology. The main grape variety is Sauvignon, either pure or mixed with Muscadelle or Sémillon. The “classic” dry white wines are fresh, fruity, slightly carbonic and to drunk during the year of production if possible. The "primeur wine", improved by ageing, fermentation and maturing on the lees in barrels, are more rounded, with a more complex aroma, and can be kept for many years while still improving in quality. These well-balanced wines, which were the traditional production of the Bergeracois region, are to be rediscovered. Thanks to the developments in œnology, the sulphur tastes and the excessive chaptalizations (addition of sugar) disappeared. They are fruity wines, delicate, which are not thick. Served well chilled, they can be consumed equally well during with meals or indeed anytime. These are great noble-rotted sweet white wines, improved thanks to the development of the “noble rot” which concentrates the sugar in the grains. These are manually harvested with successive passages in order to collect only the best grapes. The wines from the Monbazillac region age the best. The great years such as 1990 or 1995 can give a must reaching up to 24° (don’t worry: only fifteen or sixteen degrees will turn into alcohol). They are full, fleshy, very perfumed wines and mature well. Never sold before 1 year old, as they get better with age, finer and more complex. Very different from the other noble-rotted sweet wine, their acacia honey and roasted tastes give them a remarkable typicity.